With the continuous globalization of Russian wealth we ensure the access to our global portfolio of products and services across the international booking locations. Our innovative, tailor-made investment solutions let you decide on the scope and frequency of advice, portfolio monitoring, research insights and investment ideas you receive. You can count on us to tap into our global network of investment specialists to deliver a reliable, transparent and proactive approach to managing your assets. Finding the right solution for your assets is only possible if we look into your personal circumstances together with you, documenting the facts, the background, and your goals and dreams. Your assets are not the only factor in this process; the values that are close to your heart are also important. That is why we take the time to become thoroughly acquainted with you and your needs. The path to your portfolio has five steps and is based on our advisory process. Needs analysis: The focus of our professional advice is on your needs and goals regarding wealth building, for example. Your personal advisor will systematically assess your personal and financial situation with you. Financial concept: Based on the needs analysis, we will create an overview of your personal assets together with you – your financial concept. Client profile: As part of a risk analysis, we will discuss with you your personal willingness to take risks and your financial ability to bear them. 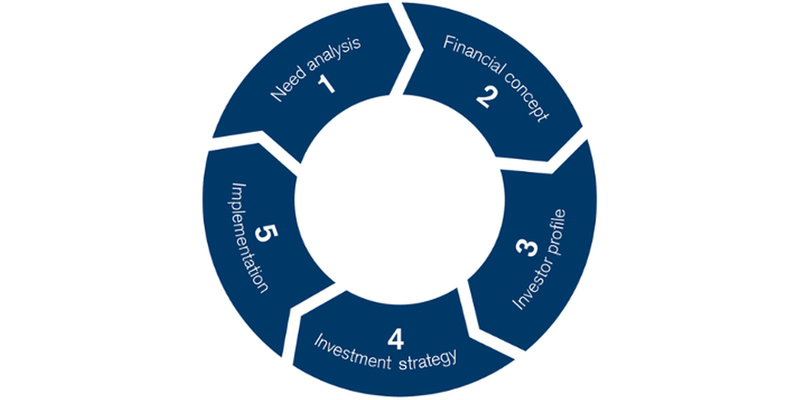 The client profile defined through this process forms the basis for an investment strategy that is tailored to you. Strategy: We present you with potential financial strategies which match your investment objectives and risk profile. Your relationship manager will always take your individual needs into account when advising you on your choice and configuration. We then use this strategy as the basis for managing your portfolio and creating your individual (investment) solution. Implementation: Lastly, we prepare a recommendation for your portfolio. Continuous management of your portfolio and regular reviews of the selected strategy are key factors in this process. This enables us to ensure that together we can respond to market developments and changes in your personal circumstances with goal-oriented action. As a trading-oriented client, you will have direct access to market specialists on the trading floor covering a wide variety of asset classes. These include traditional assets such as equities, fixed income, foreign exchange, and precious metals. Additionally you will benefit from access to a wide range of listed and OTC derivatives, structured products and commodities. With a proven track record and broad industry experience, your Direct Access Client (DAC) advisors will be your primary, independent trading partners. You will be offered an extensive range of services including market insights and event notifications. We will also provide innovative trading ideas based on research and flows while proactively monitoring your positions and advising you on trading strategies. Credit Suisse is a leading provider of alternative investment solutions, offering clients innovative products managed by senior Credit Suisse investment professionals in partnership with top-tier alternative investment managers. We offer you the experience and expertise of over 900 alternative investment professionals, as well as access to highly focused managers with a local investment presence in more than a dozen countries and across multiple asset classes. With Credit Suisse you benefit from a wide variety of solutions in private equity, real estate, hedge funds, loans, and quantitative and index strategies. With our tailor-made discretionary mandates, you set the goals for your assets with your personal relationship manager and a portfolio manager and we do the rest. Your relationship manager will ensure it that your strategy is implemented in strict accordance with your requirements and provide you with regular progress reports. Our professionals then actively manage your assets, giving you the benefits of a proven, structured investment process as well as the full expertise and capabilities of Credit Suisse. Our tailor-made discretionary mandates are managed in line with the highest ethical standards and offer attractive performance and solid risk management. They are also very flexible. As markets change or your needs evolve, you will be contacted by your relationship manager; you can easily request modifications and can be sure that they will be implemented quickly and professionally. Given the wide range of financing options that are available when purchasing or renovating a house or apartment, personal and knowledgeable mortgage advice is essential. Good financing for your home means that your mortgage model and term should be correctly structured. The focus should not be entirely on achieving the best possible interest rates. You can receive a personalized solution based on advice from our financing experts. Because a mortgage is a long-term commitment, the goal of our experts is to ensure long-term affordability.